NORWEGIAN KELP:A natural seaweed – A rich source of trace minerals including iodine, used for proper glandular function and metabolism. An excellent source of vitamins A, B1, B2, C, and E. These vitamins are beneficial for maintaining proper health and are responsible for the growth of bones, a healthy heart rate, a sound central nervous system, and helping muscles stay firm and strong. Norwegian kelp grows deep in the ocean, mostly in cold waters, so it contains valuable nutrients from the ocean floor. Aside from nourishing the glands, it is beneficial for overall good health. Supports healthy pigmentation and coat highlights. CALCIUM CITRATE: Calcium is best absorbed in an acidic environment, hence calcium citrate is the best absorbed supplemental form of calcium—it does not require extra stomach acid for absorption. Intended to provide nutritive support for healthy bones, teeth and nerve function. Not just for Senior Dogs or those who may have possible joint issues! Active athletes (agility dogs, surfing dogs, dock-diving dogs, weight pulling dogs), show dogs, working dogs (police, arson, search and rescue K-9s), sled dogs, hunting dogs, herding dogs, AND large breed dogs, as well, will benefit from the addition of Glucosamine to their daily regimen. 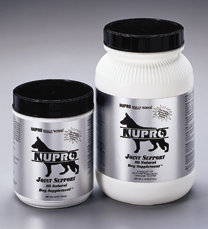 The combination of NUPRO®‘s raw, unprocessed formula with the added extras makes for a superior product from which ALL adult dogs will reap the rewards! GLUCOSAMINECOMPLEX(500 mg. per 1 oz. scoop) is our own special formula. It is an easily absorbed natural substance that stimulates the production of proteoglycans which help to maintain the health and resiliency of connective tissues and restore the damaged cells of cartilage tissue. Glucosamine Complex helps to promote production of synovial fluid for lubrication of joints. MSM (300 mg. per 1 oz. scoop) is a natural source of bioavailable sulfur, essential to support growth and maintenance of healthy tendons, cartilage and other connective tissues. MSM helps to maintain healthy fluid pressure of soft tissues. Ester-C® Chelated Mineral Blend (300 mg. per 1 oz. scoop) supports a strong immune system and healthy joints by boosting absorption of Glucosamine Complex & MSM and promoting collagen formation. NUPRO®, made using fresh premium quality health food ingredients, contains a full range of vitamins, minerals, enzymes, amino acids, and essential omega fatty acids – All in their natural raw forms. Whether you use commercial diets, feed the B.A.R.F. diet, or cook for your animals, NUPRO® should be a fundamental part of your pet’s daily nutritional program.